AudioTechnica are a leading manufacturer of microphones in the UK and they have a solution. The have a fantastic gooseneck microphone that is ideal for houses of worship and comes with a range of mounting solutions. The U857AL range also currently has a version terminated in a 4 pin connector that drops quite nicely into any of their UniPack transmitters. A little bit of work fitting the microphone to the stand and finding a good spot for the transmitter and the job's done. Depending on your budget you could look at the new 3200 series kit or even the good old 2000 series will be a great match too. Both of these systems are available in UHF CH70 licence free bands and UHF CH38 licenced bands. The second reason that we'd opt for these in conjunction with the U857 is that there's a drop-in charging station available for both ranges! As you well know one of the worst things about radio mics is having to remember to change the batteries to make sure they're working for the service. Wireless transmitters are often left on and it's so frustrating when you realise the batteries are flat and there's none left in the safe. This 'leaving it on issue' is even more relevant to the wireless lectern or pulpit scenario as the belt pack isn't on a person and therefore more likely to be left switched on. At least with a charging dock you can simply drop it back in for a few hours and get some life back into the batteries without having to go the expense of putting new alkaline's in every week and more so doing away with the panic run down to the local shops to pick up some new batteries. There's also a 2.4GHz option available with the superb System 10 from AudioTechnica but this system doesn't have a drop in charger solution. The boundary and XLR wireless base units can be charged via a simple USB charger so it'll still save you money on those batteries in the long run. Feel free to give us a call if you need a wireless solution for your lectern, reading table or pulpit and we'll be happy to help. In fact, get in touch if you have any queries for systems in houses of worship! Can you mix and match Trantec and TOA? We often get asked if you can use one manufacturers wireless transmitter with another manufacturers receiver. Generally we'd advise that it's always best to use equipment from the same manufacturer that has been designed to work with each other as this is the best way to ensure the system will work as expected and when needed. You can guarantee that you'll do a test and all will be great then for some unknown reason it all goes wrong at the worst possible moment. We do appreciate however that in some situations there may not be a budget available to purchase the correct equipment or there's often times where organisations such as charities or places of worship get donated a box full of stuff from the place down the road or from someone clearing out their garage or loft. Earlier this month we had an enquiry from a long standing customer who couldn't afford to buy a replacement TOA transmitter to go with his WT-5810 receiver unit and wanted to know if the S4.04-BTX from Trantec would work instead. So we looked into this for them and did some testing. We identified that the Trantec transmitter do work with the TOA receivers but the chances of matching up frequencies are slim. Now it starts to get a little bit messy because depending on which TOA receiver you have will determine what you may get to work. If you look on the TOA receiver somewhere it will have a sticker with a model number on and also an indication as to the frequencies in use; this will be a D02 or D04. Once you have this information you can use the information below to see if you can match something up. If you do have a D02 unit you should really have it retuned as the old CH69 frequencies should no longer be used and are illegal in the UK. TOA's 64 channel receivers only have 16 channels programmed in as standard so you can apply the above to their WT5800 and WT5805 receivers too. If you are desperate to make a mismatch of TOA and Trantec work it could be cheaper for you to send them all to us and we'll do our best for you. This would probably still be cheaper than new equipment but as we said at the start you'll not get a better more reliable solution thank sticking with the correct kit from a single manufacturer. As part of our explanations on microphone pick up patterns we've been requested to include the hypercardioid pattern the we previously mentioned but didn't expand on. 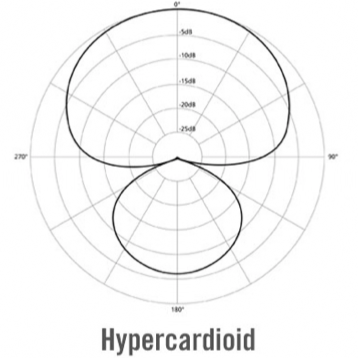 A hypercardioid pattern is very similar to a supercardioid pattern but it has an even narrower front pick up angle. This can be very beneficial if you are trying to filter out unwanted noise or control feedback in an acoustic environment but it does have its downsides too. Because of the narrow front pickup a very disciplined microphone technique will be required to make sure the user directs their speech or vocal within the pickup angle. If the user can be taught the correct microphone technique then the benefits will be fantastic. As with everything in this life you don't get anything for nothing so the tighter front control will also result in a rear pickup lobe which will be greater than a standard cardioid microphone. This is best understood by looking at the great polar pattern provided by our friends at Shure. So to summarise, the hyper cardioid microphone pickup pattern has a very narrow forward pickup pattern ideal to help control noise pickup but you'll need to be careful about what rear noise is picked up and don't forget about the proximity effect whereby the bass response of the microphone increases if the user gets too close. Over the last few weeks we've been picking away at different microphone pickup patterns and provided a brief overview of each pattern in turn; these included the most popular cardioid pattern along with the super-cardioid, omni-directional and figure-8 patterns. There's a few other patterns too such as the hyper-cardioid and sub cardioid but we've decided to just focus on the basic set for now. So now that you're a bit more clued up on what each pattern is you may have a clear idea of which microphone you should be looking for but what happens if you have the need for multiple pickup patterns? There's the obvious choice of purchasing different microphones to cover different applications and this is the most popular route to go down as you can also choose microphones that suit the tonal requirements of the application in conjunction with the pickup pattern however, there are still situations where you may only want to purchase a single microphone for all situations. Well there's no need to panic because a lot of the major manufacturers offer microphones that allow you to choose the pickup pattern at the flick of a switch. 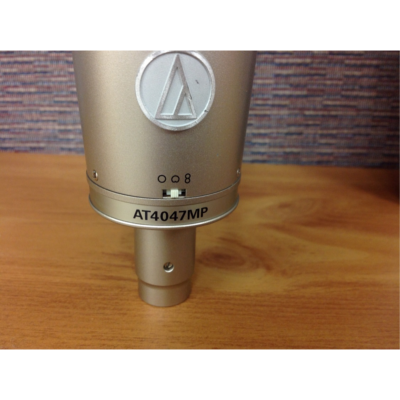 The selection on the microphone is normally marked up with small icons relating to pick up pattern and if you check out the image of the Audio-Technica AT4047MP you'll see an example of typical markings. If you look closely enough you'll see that each symbol looks like the pickup pattern that we've previously covered in our other blog entries so now you know which one to choose! We hope these recent posts have provided some help to those of you either just starting out with sound equipment or maybe provided a little refresher to those of you who have been around a little longer. Whilst the omni-directional and cardioid pickup patterns are the most widely used there are other patterns out there to and they all have their uses in our world of picking up audio for broadcast or recording. One such pattern is the figure-8 polar pattern which is capable of picking up audio from the front and back whilst rejecting noise from the sides. With this ability to equally pickup audio from the front and the rear it is often referred to as a bi-directional pattern. It is easier to imagine the pick-up pattern as a figure-8 where the microphone head is situated in the centre point where the lines of the ‘8’ cross over each other. The figure-8 pattern is often used to record two sources at the same time; this could be two voices from people speaking or it could be a method of recording in stereo although other techniques to achieve this are available too. With careful positioning a figure 8 microphone could be the answer to a lot of solo artists needs as the pickup pattern can be used to pick up both singing and guitar audio without picking up too much noise from the audience. As with all microphones the selection of the microphone type and its positioning is very important and if a figure-8 microphone is used in the wrong application it can result in very poor audio. 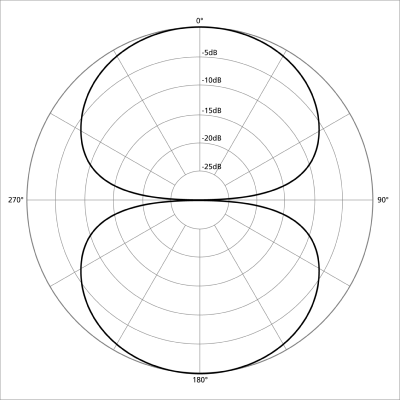 One such scenario would be the use of a figure-8 pick up pattern instead of a cardioid which would result in all the audio from the rear of the microphone being fed into the broadcast or recording. 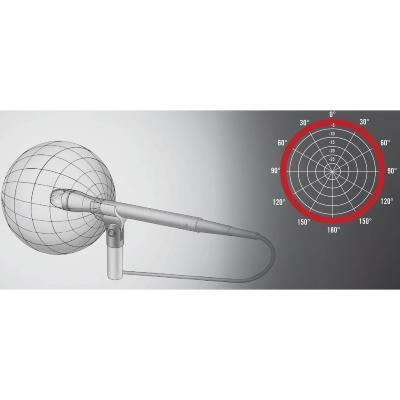 If you’ve heard of the term omni-directional microphone you may be wondering what it’s all about? Basically, the word ‘omni’ is a Latin prefix that means ‘all’ or ‘every’ so in the term omni-directional microphone it tells us that the microphone will pick up sound from every direction. 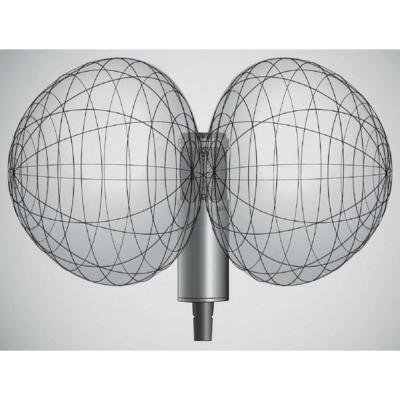 Whilst omni-directional microphones have their uses, and are employed a lot around the world, you still need to appreciate their capabilities and ensure correct replacement. As they can pick up sound from all directions the chances of inducing unwanted noise into your feed is greatly increased and this can also result in feedback occurring which you definitely don’t want. They are fantastic for picking up the ambient noise in a space to add to your recording and can also be used for induction loop systems to ensure the hard of hearing are included in the atmosphere of a room instead of just being fed the main source material. All microphones start out their lives as omni-directional and then those clever engineers do their stuff and apply techniques and construction methods to manipulate and shape alternative pickup patterns such as cardioid and super- cardioid as previously discussed. 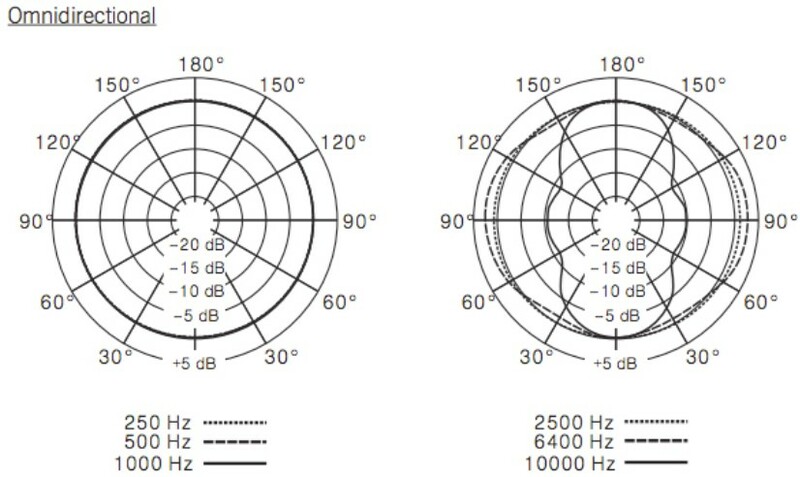 Looking at the diagram below you can see that for the vast amount of frequencies the pick-up capabilities from all around the microphone head are pretty static and have the same capabilities. It’s not until you get into the higher frequencies that directionality kicks in; on this microphone you can see the 10kHz frequency does exhibit directionality and that’s why it’s important to understand your microphones capabilities.